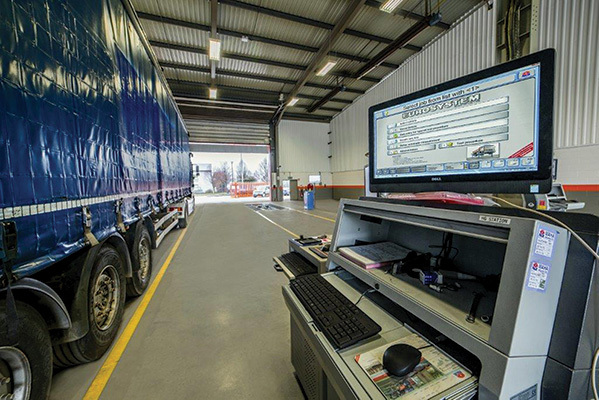 As Ireland’s only 24-hour CVRT and commercial vehicle service centre, Spanners Ltd. allows operators to keep downtime to an absolute minimum by having their vehicles tested at a time that suits them. We dropped into their state-of-the-art workshop in Dublin 12 and met General Manager Brian Bolger to find out more about the comprehensive range of services provided. Conveniently located just off Junction 10 off the M50, Spanners’ Ltd.’s fully-equipped workshop caters for all light and heavy commercial vehicle needs, from a minor service, safety inspections or CVRT preparation work through to a complete refurbishment, with all work carried out by experienced and qualified professionals. The workshop team of 33 includes auto electricians, motor technicians, HGV technicians, metal fabricators, tachograph and speed limiter technicians and (five) CVRT testers, ensuring that consistent high-quality, friendly, professional and reliable solutions are provided in line with operator expectations. In addition to high standards and versatility, another thing which really sets Spanners Ltd. apart is the fact that they provide an unrivalled 24-hour service. Their CVRT centre is the only 24-hour test centre in Ireland and it is backed up by a 24-hour service and repair centre to guarantee customers a unique service that’s truly second to none. As well as complete vehicle / fleet maintenance, repairs, servicing, test preparations and CVRT testing, tachograph calibration, speed limiter and vehicle plating all carried out in an ideally-located, secure, modern, spacious eight-bay facility – fully insured and manned by master technicians using the latest tools and diagnostic equipment, Spanners Ltd. also offer a 24/7 breakdown recovery service and are willing to collect and drop off trucks, vans and trailers at any time of day or night. No stone is left unturned in the commitment to guaranteeing absolute customer convenience and satisfaction. As the only man in Ireland who oversees a 24-hour CVRT test centre, Brian Bolger certainly knows a thing or two about offering customers a unique and tailored service. “Spanners Ltd. has the same owner as the Panda Group and was initially set up in 2012 to look after and maintain Panda’s vehicles before expanding into Dublin by purchasing this premises and then putting in the test centre,” he reveals. “So we are coming very much from a background of understanding exactly what is required in terms of getting vehicles tested without having them off the road. The Panda Group’s experience was that it wasn’t ideal having vehicles tested during the day, so we decided we would test at night if that’s what owners wanted. We set up the state-of-the-art workshop and test centre here to offer a unique service, 24 hours, from Monday until Friday.” Spanners Ltd. is also open on Saturdays, from 8am until 2pm. Their comfortable waiting area includes WiFi, tea and coffee making facilities and Sky TV. As it is still a relatively new business, there is plenty of scope for further growth. “A lot of people don’t know about us yet but we’re getting our name out there. As word spreads of the service we’re providing, we expect to take on a lot more business, both on the testing and workshop side of things. Our test centre is expanding as our customer base expands and as it stands we can currently offer hauliers a test booking within 24 hours which is a service we are looking to maintain to our customers. The idea of waiting over a week to get a test booking is completely impractical for any haulier. As well as the Panda Group, Spanners Ltd. look after vehicles for a who’s who of major fleet owners including Roadstone, Christy Lucey Transport, Hendrick European Transport & Logistics, Dublin Coach, Plant Master, ESB, Leaseplan and Harris Group, all of whom are guaranteed professional and convenient testing / maintenance solutions. Spanners Ltd. are also dealers and distributors of VPG onboard weighing systems as well as running a Stoneridge tachograph dealership. Going forward, the prognosis is highly encouraging for this unique commercial vehicle workshop and test centre, which has cleverly tapped into a niche market by offering 24-hour services. “We strive to be as customer-focussed and friendly as possible, with a very professional outlook. We only started testing in December and the feedback has been extremely positive so far. Working around the clock to cater for commercial vehicle owners’ needs, Spanners Ltd. is a unique, progressive workshop and CVRT test centre with a big future.